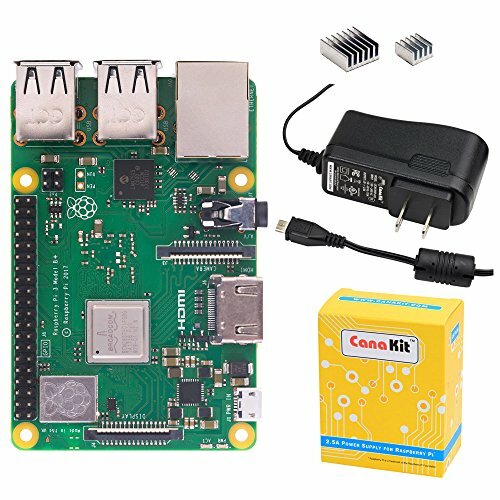 An exclusive kit from CanaKit that includes the fastest model of the Raspberry Pi family - the Raspberry Pi 3 Model B+ (B Plus)! The Raspberry Pi 3 Model B+ is the latest production Raspberry Pi 3 featuring a 64-bit quad core processor running at 1.4 Ghz. It incorporates built-in WiFi and Bluetooth connectivity with enhanced dual-band 2.4 GHz and 5 GHz WiFi, Bluetooth 4.2/BLE and faster Ethernet. To take full advantage of the improved power management on the Raspberry Pi 3 B+ and provide even support for even more powerful devices on the USB ports, a 2.5A adapter is recommended. The power supply included in this kit incorporates a noise filter to provide the highest stability and comes with a 5-foot cable. This power supply can power the Raspberry Pi 3 B+ and other USB accessories (such as most portable hard drives) without requiring an external powered USB hub.